Thrifting with Pals – A Good idea? I thrift as a job and I’m really very lucky. It does mean I mostly go alone as it’s not a social thing where I stop for cuppas and chats – except for bank holidays. I like to get a gang o’pals together and we head off out to a field not too far from town and hunt down treasure. 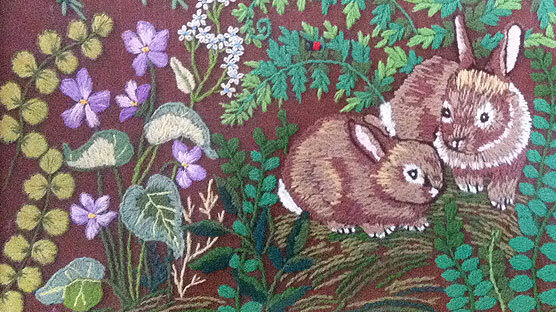 This morning one of my thrifting buddies picked up this delight – an absolutely adorable hand embroidered pair of bunnies frolicking in the undergrowth. I helped him carry his swag off the train but didn’t quite manage to sneak off with it……. damnit. Must sharpen up my stealing a picture under my sweater routine. 2 Responses to Thrifting with Pals – A Good idea? Aw your reaction I leant you ‘The Treasury of Kittens’ when you needed a pep up was something I’ll cherish forever.